How is it possibly the end of May already? I know I say this at the end of each month but I just can't believe how fast this month has gone by! So, tomorrow it will be the first of June and the first day of winter. Today there was actually a cool change and for the first time in sooo long I wore a jumper! Yay! Although winter here is mild compared to the southern parts of Australia, it is still so nice to be able to start wearing long sleeves, cardis and jumpers. 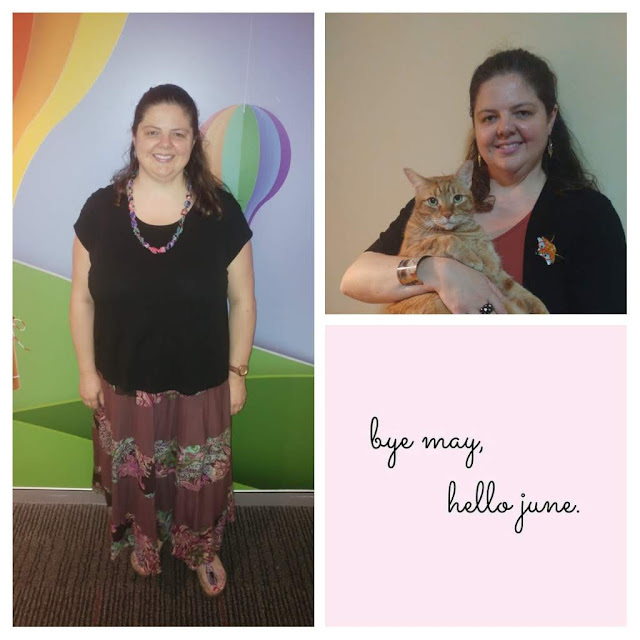 Before June starts though, I thought I would look back on my favourite ten outfits for May. Which outfit from May do you like the best? Let me know! I'd love to hear from you! 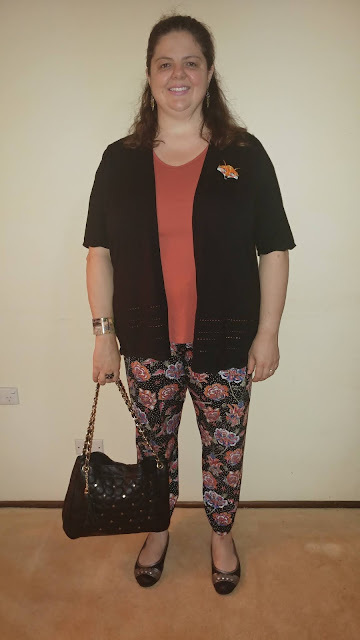 In my attempt to regain my missing mojo, I thought a colourful outfit was in order! 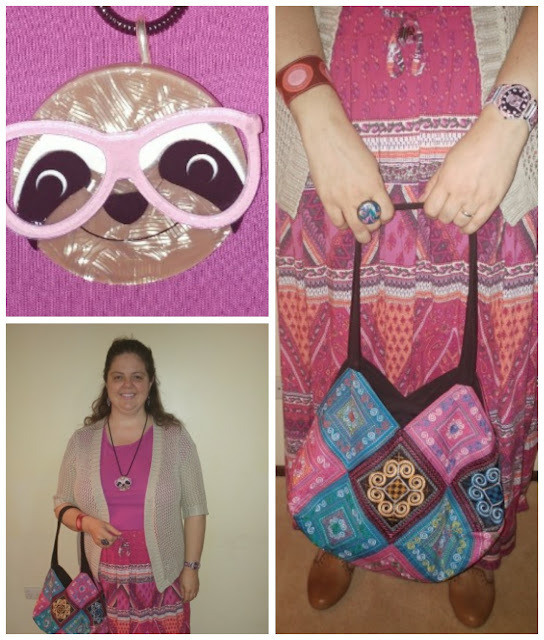 As well as dressing in vibrant colours, I thought it was also the perfect time to wear one of my favourite brooches again: Sammy the Sloth! The thing I like most about wearing Sammy, is that people always smile when they see him. Seeing others smile is definitely one way to improve my mood. Shopping is another way! (my earrings and watch are new by the way😉). I've been on a pants shopping spree lately! Now that the weather is cooler, I've been wearing pants or jeans every single day. There are so many bright and vibrant pants around at the moment, as well as lots of great sales, so I've been stocking up! I never used to wear pants at all, but in the past year I've bought so many pairs and now can't imagine life without them! This pair is so comfortable and I love the print mixing combo of spots and flowers together. With the different colours featured in this print, it makes finding a top to match so easy, as the possibilities are endless! I thought it was time for Oscar Wildenfox (brooch) to make an appearance again, so I built the rest of the outfit around him! I prefer wearing brooches on cardigans and jumpers rather than on tops, so with the cooler weather I'm excited to start wearing my fave brooches again! I am just loving the weather right now and it's so good to start spending more time outdoors. For most of the summer it was so hot and humid and by mid-morning the UV index was already extreme. That meant if you wanted to go for a walk outside, you basically had to go either ridiculously early or wait until the sun went to bed! Therefore, the only exercise I did over summer was in airconditioned comfort, usually walking around and around the shopping centre! Just like Carrie Bradshaw: shopping is my cardio! I much prefer to be outside though, so no more wandering aimlessly around the shops spending money I don't have on things I don't need! (I have a feeling this won't last long so I am not making any promises!). All I am promising is that I will make a genuine effort to be more active and get some sun and fresh air. Hopefully this will help me get out of my slump! This is what I wore on Saturday. The weather was beautiful: warm in the sun and a little cool in the shade. Therefore, I thought it was the perfect weather for a hint of mint! This was my first wear of my recently purchased sleeveless knit vest in mint. It doesn't photograph as minty as it looks in real life, but you get the idea! 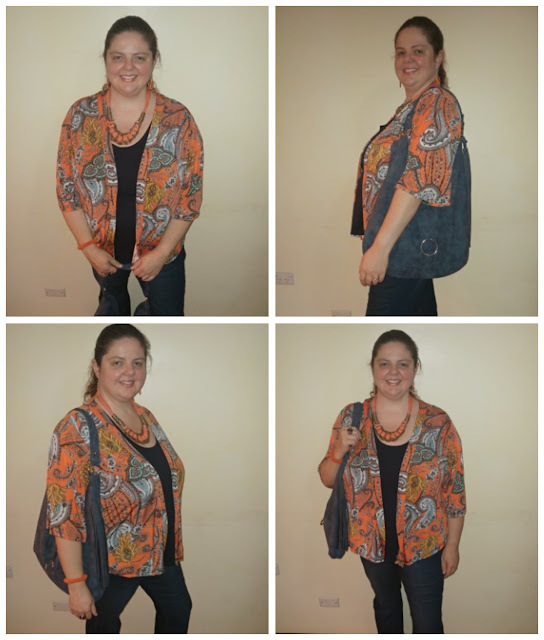 It was the perfect amount of coverage and added a bit of extra colour and texture to an otherwise pretty ordinary outfit. I chose to go with a minty grey colour scheme but added my recently purchased Frida Kahlo as a cat brooch, to add some cheer and quirk! 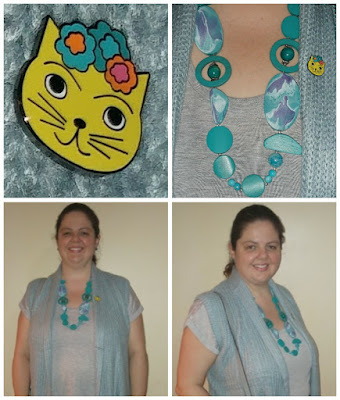 I also wore my chunky minty necklace and my cute new sparkly kitty earrings as well, for the first time. It was a day of firsts! Speaking of firsts, I visited the big Salvo's op-shop on Saturday and bought absolutely nothing! I really must be in a slump, because I always find something to tickle my fancy! Oh, well! There's always next time! Do you consider yourself to be adventurous? What does it mean to you to be adventurous? Has the meaning of adventurous changed for you as you've grown older? 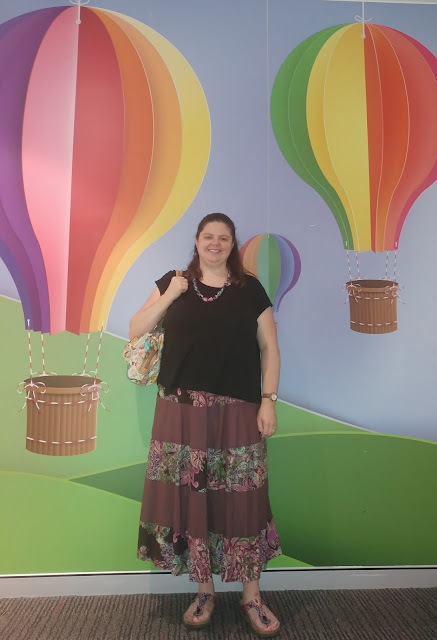 The other day I was out shopping with the family and noticed a new play area for kids, with hot air balloons painted on the walls. After a quick family game of table tennis in which I truly sucked, the images of hot air balloons got me thinking about adventures and what it means to be adventurous. I've never been adventurous in the extreme activities kind of way, such as partaking in skydiving, bungee jumping or even hot air ballooning! I've never been interested in the first two activities, but I would like to ride in a hot air balloon and float up, up and away into the sky!